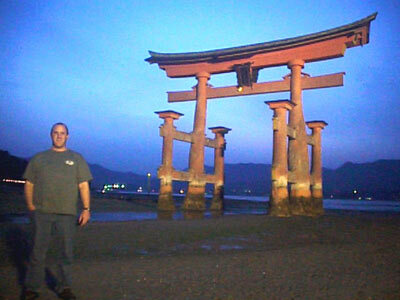 Miyajima was a fun place to visit. We ended up staying two nights on the island, the only place where we stayed two nights during eight nights of traveling through the main Honshu island of Japan. 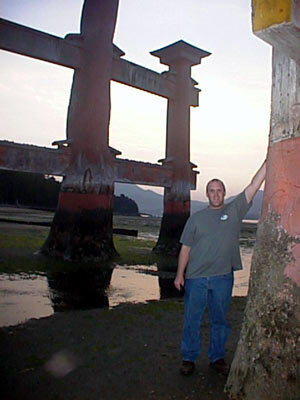 Seth had always wanted to visit Miyajima to see the big red gate in the water. However, we never made it here while we lived in Japan. Therefore, this was one of the places we really wanted to visit now that we were back in Japan as tourists with a Japan Rail Pass. We decided to stay on the island instead of staying in Hiroshima and just coming for a day trip. This was a good decision. We arrived at Miyajima at approximately 5:30pm. Our first images of the island were from the ferry boat. 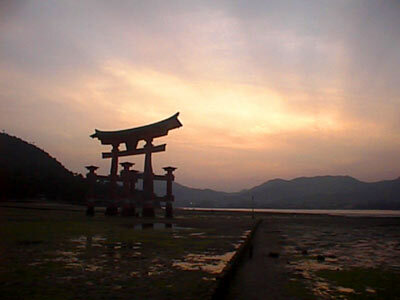 The tide was out and numerous people were gathered beyond the red tori at the water's edge. We couldn't make out what they were doing. Later, it became apparent that they were digging for mussels. We had gotten the names and numbers of royokans that were not in the English language information guide on Miyajima. Tara headed to the first one and was redirected to an English-speaking hotel. 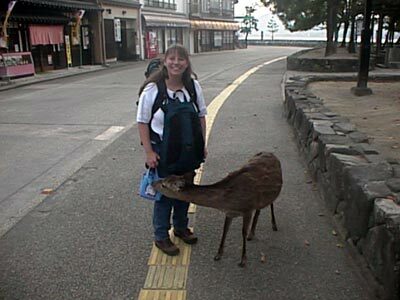 We were then standing in the park in front of the ferry, surrounded by deer, when a friendly Japanese man came up and started talking to us. He was speaking only in Japanese, but was interested where we were from and why we'd come to Miyajima. He lived just across on the mainland about 25 minutes away. Tara had fun talking to him and when the conversation rolled around to where we were staying tonight, Tara pulled out her list from Hiroshima Tourist Information. He proceeded to get out his mobile phone and call a ryokan for us. How lucky, the first one he called would take us and for an OK price of 13,000 Yen. He made sure we found the ryokan by walking us to its door. We thanked him profusely. Tara really liked our room's view since it had a small balcony that looked right out over the park where there were deer. Overall though, the ryokan was a bit older and when you took a bath, you had the distinct feel that you were taking a bath in someone's house! It was a fine, Japanese style room, but it didn't compare to the beauty of the room we had in Hirosaki. We didn't hang around long in the room though - since the sun was setting and we wanted to see the sunset. The sunset was pretty, but not spectacular. The real nice light came after the sun had set. We walked towards the red tori out onto the muddy area since the tide was still out. There were still people digging for mussels, but hardly any tourists. When we reached the tori, we started taking pictures. The image of the gate in the dimming light was beautiful. We kept taking pictures. We were the only two out by the gate and it was very enjoyable to see the temple behind us and the gate in front of us illuminated. The tide was still out, so we were able to walk right up to the gate. 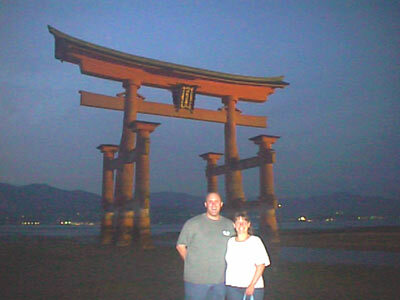 We took photo after photo after photo and we hoped to come back after dinner to see the tori surrounded by water. For dinner, we had one choice: okonomiyaki at a restaurant right next to our ryokan. They were open until 8:30 at night. We arrived at about 8pm and sat down right in front of the cook's grill. We'd heard about how okonomiyaki were a specialty in Hiroshima, so it was good that we were getting to try the dish. We had fun watching the cook make up the tortilla, cabbage, noodles and put it all together. Both Seth's with cheese and Tara's with garlic were yummy! After dinner it was dark and we decided to go back to our room, transfer photos off the digital and then go back out to take more picutres of the tori gate. The only problem with this plan was that our ryokan door was locked when we tried to go back out. Tara had remembered the lady saying that the door would be closed, but Tara thought it was closing at 10pm. So, we figured that either Tara had misunderstood the Japanese and the lady had said 9pm or that the ryokan lady had figured we were in for the night, so had locked the door. No big loss - especially since we had decided to stay for one more night. In the morning, we got a slow start. Seth had been up late playing computer games and Tara was in no hurry since she could sit on the balcony and see deer out the window. When we did get moving, we were happy to see that the tide was still in and the red tori's base was underwater. 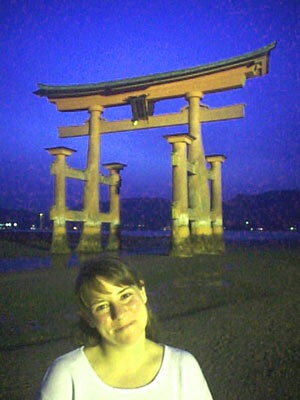 We, of course, took more photos and then walked through the town's main shrine where we took more pictures. We think Japan is the most picturesque place we've visited in a long time. We find ourselves taking photo after photo after photo! After walking through the shrine, we had a decision to make: do we go up the hill on the ropeway or do we go to the aquarium. It was getting too late to do both. In hindsight, Seth made a very good decision when he decided that we'd go to the aquarium. We arrived at 2:30pm, just in time for the penguin walk-about. We didn't know what the penguin walk-about was, but we rushed to the penguin area to find out. Immediately, within the first five minutes, we decided that we'd gotten our 2,100 Yen admission price worth. We saw a cute little penguin standing outside of the penguin area, being pet by all sorts of little kids. We also go to pet the penguin. It was great fun and it got even better because for the next half an hour we'd see the penguin walking around the zoo. This penguin is actually taken on half an hour walks a few times a day. How fun. Next we stopped to watch these black and white guys play with their deflated soccer ball. It was lots of fun seeing them swimming around, trying to bite the ball. They looked very interested in what they were doing and not at all bored or swimming in the same pattern again and again and again. It was great to see the animals looking like they were having a good time. The aquarium itself was not spectacular in any way. It actually seemed to have a low budget - especially compared to the aquarium in Monaco that we'd visited over the summer. However, all the animals seemed to be having a good time and getting attention from the people working with them. The otters were also cute. We saw them being fed and they were receiving a very controlled diet of fish. After being fed, they were given a new burlap bag in their house and we watched as one otter tried to take the bag out of the house while the other otter tried to hang onto the bag from inside the house. It was really cute to see them playing. We came back later in the day and noticed that the burlap bag had actually been drug out of the house and through the water. The one animal that Seth had a lot of fun playing with was a seal. Seth noticed the seal would follow his hand. So, he'd move his hand left and right and the seal would swim left and right. Seth would move his hand up and down and the seal would swim up and down. Seth took to running left and right along the lenght of the seal's aquarium and the seal would follow at full speed. Seth had tons of fun playing with the seal. In addition to the penguin walk-about, we saw the spitting fish and pirahna feeding show. Plus the trained seal show. Again, the facilities themselves were not the newest or greatest, but all the animals seemed to be healthy and having fun. It was a great afternoon out. By the time we were done at the aquarium, we'd again filled up our digital camera with 58 photos. We headed back to our room to transfer the photos onto our laptop computer before heading out to dinner. We almost didn't find dinner since the single local restaurant that was open on Wednesday nights was one street further back than had been marked on Tara's map. However, in the end we found the local okonomiyaki restaurant. We're glad we'd had okonomiyaki once before, otherwise, we'd have been uncomfortable being the only clueless foreigners in a restaurant with about ten Japanese. However, we could figure out the menu choices and again enjoyed watching the cook. She was much busier than the man the night before had been so it was neat to see mass okonomiyaki production right before our eyes. We each ordered our own, so we ended up taking some home for breakfast the next day. After dinner, we again walked to the submerged tori. This night, there were tons of people milling in their yukatta robes. We hadn't thought that you were supposed to go outside of your hotel in your yukatta. However, here was everyone standing in front of the tori in their robes, having their photo taken. We would have done the same except our hotel was a ten minute walk from the gate. Seth would have never made it in the tiny hotel slippers! The next day we got an early start since we would be leaving in the afternoon. Our main goal was to take the ropeway up the mountain. We hoped that it wasn't too windy. On the way to the ropeway station, we meandered through the shopping streets. It was amazing the number of shop owners who were nowhere to be found when we wanted to buy something. Once, we had to leave and come back. Antoher time we persisted and it must have been five mintutes before anyone showed up to take our money! We also walked through another temple building on our way to the five-storied pagoda. This was a big building supported by large tree trunks that was totally open. There were no walls, no screens, nothing to keep the weather out. It was interesting. The five storied pagoda was also nice, but not as unique as the building we'd just been through. We were already starting to get a good view of the town below us, so we were looking forward to traveling up the mountain. Our next tourist attraction was a 200 year old tree that had branches that went on for forever and forever. At first we didn't understand that the highly trained branch we were seeing was part of a 200 year old tree. We just realized that we were looking at a very kool tree with a long branch. Then, we realized just HOW long and just HOW old the tree was. It was truely a sight. At this point, we mused over the fact that it was a Thursday and what were we doing but wandering around Miyajima looking at temples and trees! What a great life - much better than working! We finally arrived at the ropeway after walking through a park that will be beautiful in the Autumn. There were numerous Japanese maple trees in the park and they all had fresh, bright green leaves on them. We think Miyajima would be a wonderful place for the Fall colors. Maybe we'll be lucky enough to be back one day and see this quaint bridge surrounded by Fall colors! The ropeway ride was fun and not too windy. We could look down and see native forest. There did look to be an unusally large number of dead trees, but then we noticed that these trees had tufts of green leaves at their very top. The ride was separated into two sections. On the first section, we rode in a small car by ourselves. In the second section, we rode in a larger car with other travelers. It was here that we met the British guy who mentioned Himeji and because we met him, we ended up staying at Himeji that night. He also gave Seth the inspiration to walk up to the top of the mountain. From the final ropeway station to the top of the mountain was a rough walk for the two of us. The trail was well marked and paved with drainage areas and stairs in many places - but it was steep. At one point, Seth had to sit down on a "God-given" bench to catch his breath. Tara kept going, only to lay face down on a rock a few minutes later. We figured that we really had not become fit and healthy during our ten months off of work. In fact, our time in America had fattened us up! Maybe in the future, we'll try to walk up more mountains if there are short half-day trips in the area. We figured the exercise was good for us and we did see some good views. 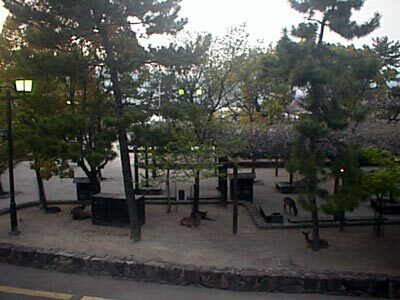 At one point, we stopped for a long time at a temple where there were five deer feeding. Tara was concentrating so much on climbing that she didn't even see the deer. There were two females, two babies and one male with antlers. We liked seeing the deer. We didn't see any monkeys though, since they'd all gone out into the forest to feed. Upon reaching the top, we were offered an orange by two nice Japanese ladies. It's amazing how nice the Japanese people are when we run into them. Imagine, saying hello to someone, chatting about the beautiful view after the hard climb and them offering you an orange! We happily ate the orange and then went into a small restaurant for udon noddles. This climb brought back days when we were training for Tara's climb up Mount Fuji. We remembered one particular day on Mount Oogusu when we had reached a similar mountaintain top - only to find the restaurant and the observation platform closed for the day. The time estimate of a two hour, easy walk as stated by Gary D'A. Walter's "Day Walks Near Tokyo" was totally incorrect. We do not recommend this book to anyone! Today, it was nice that the restaurant and observation platform were open. We wished we'd had a telephoto camera lens on the top of the observation platform since we could see a little, tiny red tori gate way, way, way down below. It was very chilly at the top of the observation platform, so we soon headed down the mountain - but not before feeding the deer! The way down was, obviously, much less strenuous than the way up. We stopped for a pleasant view on the same rock that Tara had been laying over on the way up. It was on this rock that we decided that we liked being able to get away from civilization - but only for the daylight hours of a day! We had one last walk through the town and one last photo in front of the tori before boarding the ferry. From the ferry, we transfered to a local train then to a Shinkansen in Hiroshima and after a transfer to another Shinkansen in Okuyama, we arrived in Himeji for the evening.